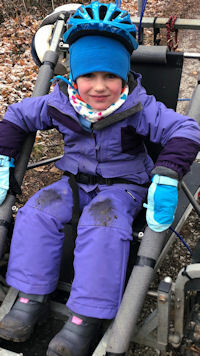 Maryland Sled Dog Adventures LLC: Maryland dogsledding and dog sled rides for Girl Scouts and Boy Scouts. The team pauses during a run. Our dog sledding team is comprised of six to nine Siberian Huskies. Our dogs come from shelters, rescues, and reputable Siberian Husky breeders. Occasionally, we also have a few visiting sled dogs. For more information on all of our sled dogs, visit our dogs page. The dogs have had a great season this year! As the seasons change, the dog sledding season begins to come to a close as the dogs get relax a bit. 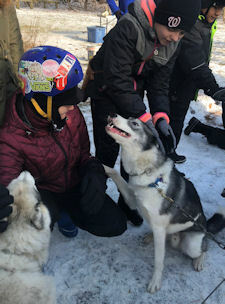 Do you want to go dog sledding during our 2019 - 2020 dog sledding season (October 2019 - March 2020)? If so, now is the time to add your name to our waitlist. Please email Catherine to be placed on our waitlist. Calling all Girl Scout Leaders! 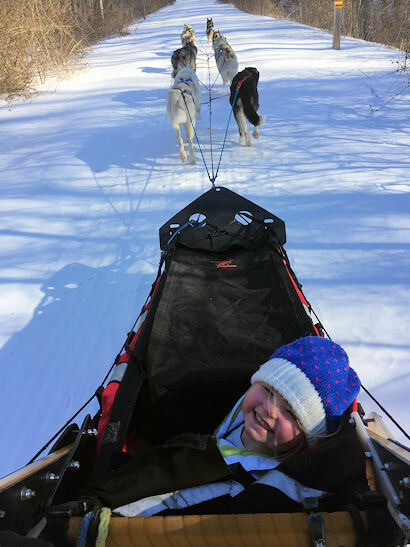 If you are interested in booking one of our popular Girl Scout dog sledding patch programs, please click here to read more about this program and then email catherine@marylanddogsledding.com to be placed on our waitlist for the 2019 - 2020 season. Our dog sledding season begins in October 2019 and runs through March 2020. Now is the time to begin discussing with your parents and girls what dates they want to go dog sledding. You could be having this mush fun! 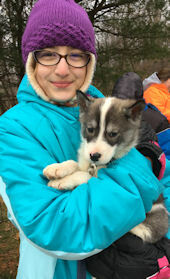 For recent photos of our Girl Scout dog sledding programs, visit our Facebook page. To see what other troop leaders thought of our program, please visit our Bark Backs. Minimum 14 girl scouts; maximum 20 girl scouts. Tagalongs age 5 and up are welcome. Are you a family interested in dog sledding? For families and small groups (1 to 4 people), we offer our Yappy Hour. 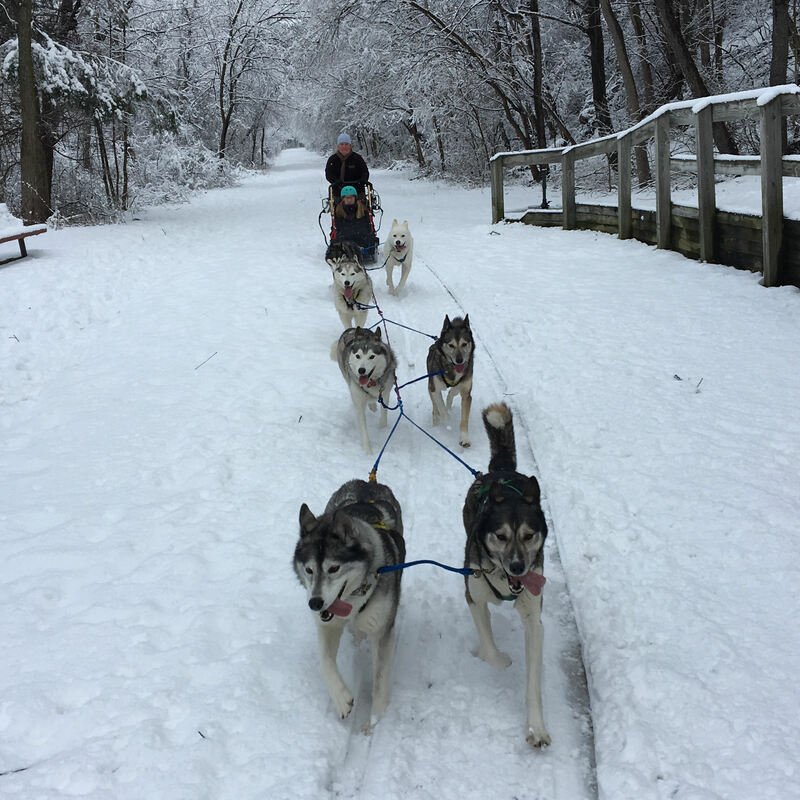 Our Yappy Hour dog sled rides include a half hour of learning about dog sledding and sled dogs and a half hour per person dog sled ride with the Maryland Sled Dog Adventures team of sled dogs. Email catherine@marylanddogsledding.com to be placed on our waitlist for the 2019 - 2020 dog sledding season. 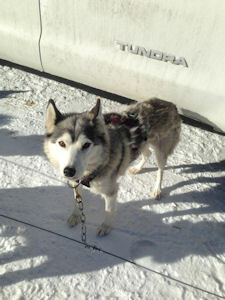 Veteran sled dog and lead dog, North Wapiti's Flare is looking for an active retirement home. Flare is spayed, house broken, good with children, good with other dogs both males and females, and good with cats with supervision. To learn about Flare, visit the Our Dogs page. To inquire about adopting Flare, email catherine@marylanddogsledding.com. 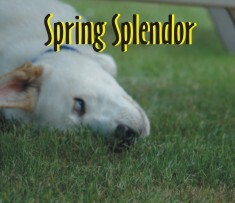 Did you know that Maryland Sled Dog Adventures LLC is on Facebook? Like us on Facebook and follow us on the trail, receive updates on our dog sledding trips, and see photos from our recent dog sledding programs. Dog Sledding comes to Maryland! No snow necessary. Welcome to Maryland Sled Dog Adventures LLC! 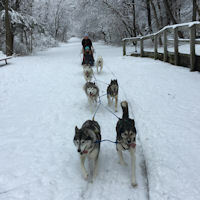 Come experience dog sledding (aka mushing) and sled dogs with Maryland Sled Dog Adventures LLC in the scenic hills of Baltimore County, Maryland. 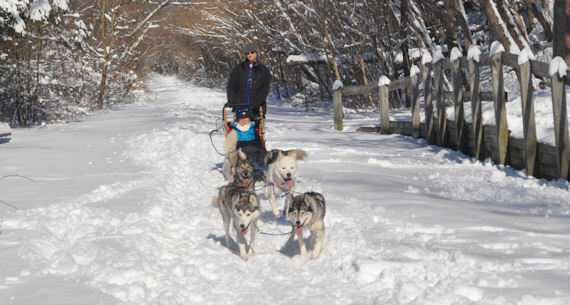 For more information on our dog sledding programs, visit our Tours page. 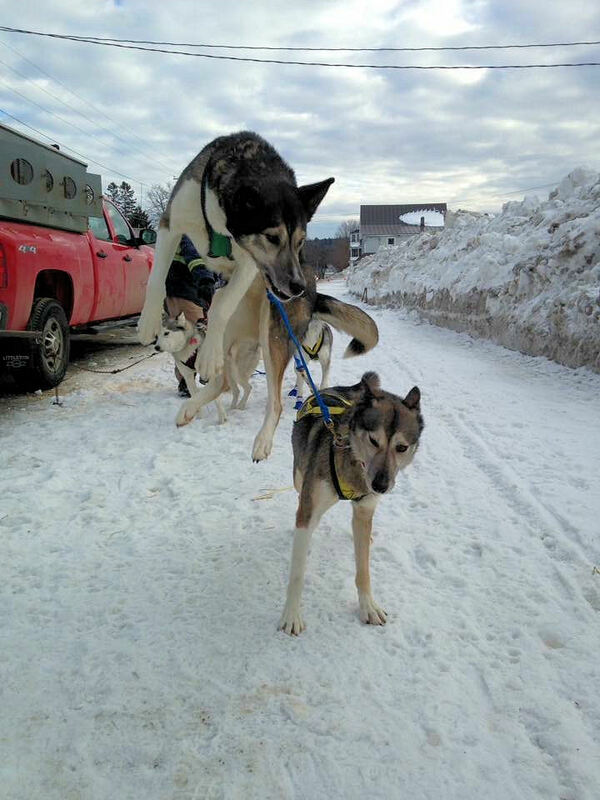 For more information about the mushers, visit our About Us page. For details on reservations, please visit our Reservations page. We are a small micro mushing kennel of Siberian Huskies. Maryland Sled Dog Adventures LLC is Maryland's only dog sled touring operation. Maryland Sled Dog Adventures LLC is fully insured and is a Nature Tourism provider with the State of Maryland. 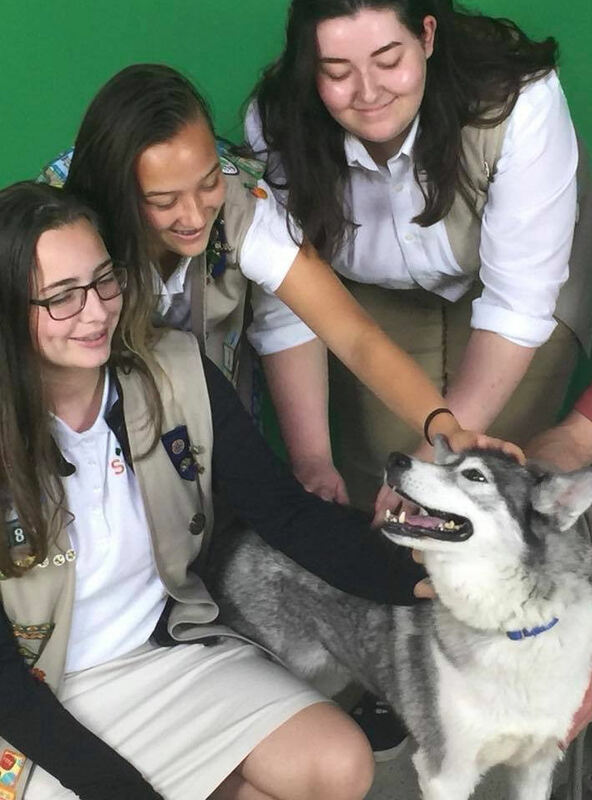 Maryland Sled Dog Adventures LLC specializes in dog sled rides and patch programs in dog sledding for Girl Scouts and Boy Scouts, and is an approved high adventure vendor and program partner with several local Girl Scout and Boy Scout councils, including Girl Scouts Nation's Capital. Our Program Partner listing with Girl Scouts of the Nation's Capital can be found here. For more information on our dog sledding patch program for Girl Scouts and Boy Scouts, visit the patch program on our tours page. To see photos from our recent dog sledding programs, visit our Facebook page. To read what people are saying about our programs, visit our Bark Back column. 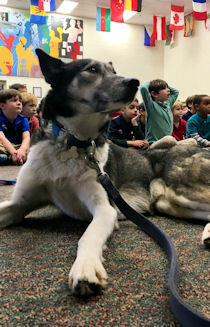 Maryland Sled Dog Adventures LLC also does special events involving dog sledding including delivering Santa Claus, childrens' birthday parties and classroom visits to schools. 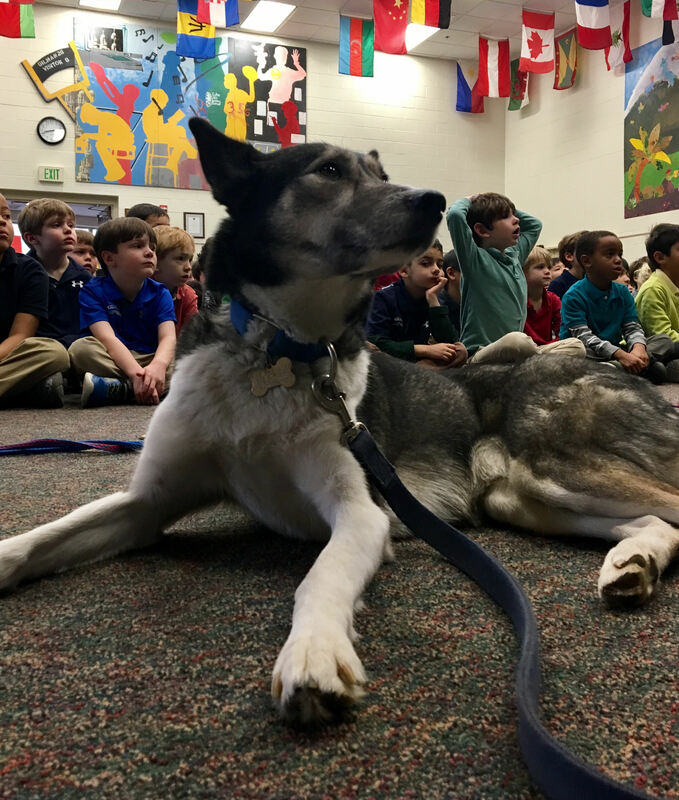 Our classroom programs on dog sledding are particularly appropriate for classes reading books by Robert Blake including Akiak and Togo, Gary Paulson's Dog Team, Jack London's classic Call of the Wild, and classes studying Iditarod. We've even visited local libraries with our sled dogs. 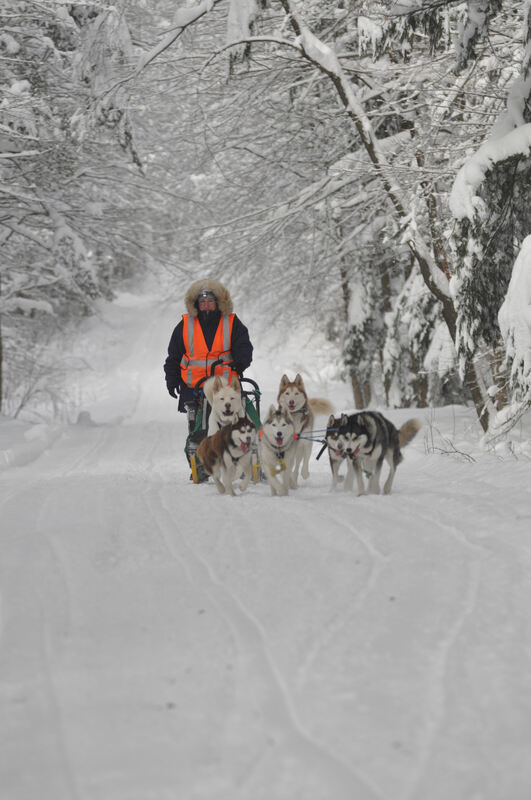 Visit our tours page for more information on all of our dog sledding events and programs. For recent photos, visit our Facebook page. So I'm sure by now you are thinking: This is Maryland, what if there is no snow? Temperatures permitting, even when there is no snow, we can still go. 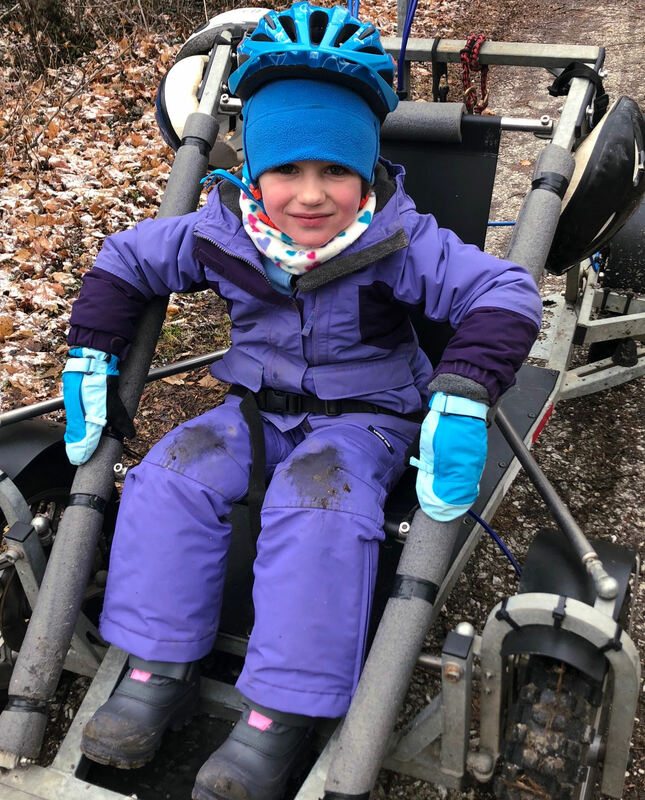 When not running on snow, which is much of the time here in Maryland, we dog sled using our three wheel and four wheel dog sled rigs (click for picture). In mushing, a wheeled cart used for dog sledding when there is no snow is called a “rig” or a “gig.” Our larger rig allows us to carry a passenger seated on dog sledding tours and dog sled rides. Do you have an adventurous spirit? Do you love dogs? 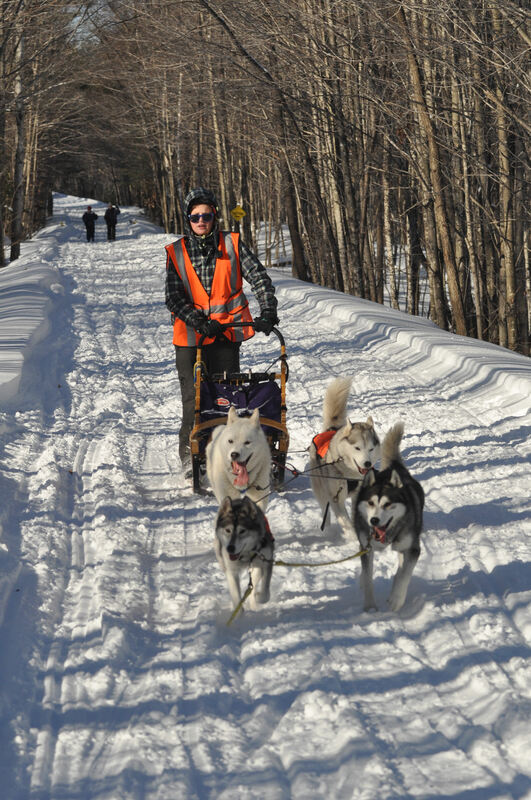 Do you want to spend four days dog sledding on snow through the scenic Maine woods? If so, check out our special women's Maine Winter Cabin Adventure and then email Catherine for more information and to register.